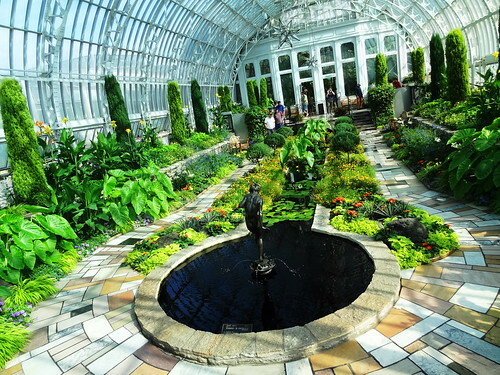 We have a full day of exploring St. Paul planned, let’s start with the Marjorie McNeely Conservatory at Como Park. 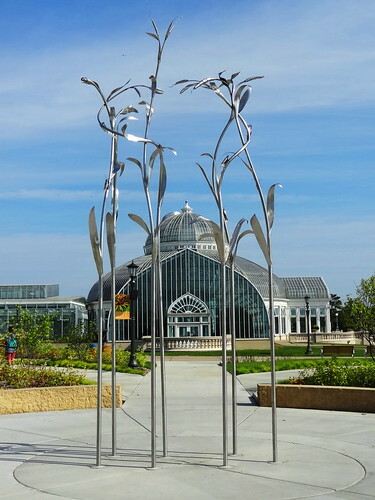 It’s another hot and sunny day, we follow fellow visitors from the parking lot to the conservatory; the exterior plaza is a combination of concrete, sculptures and raised beds. 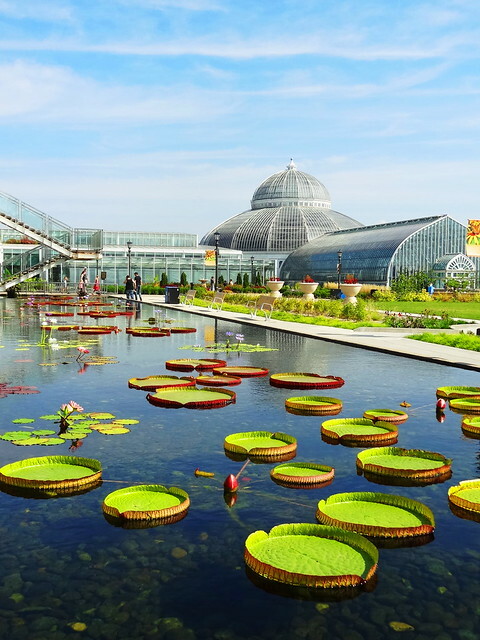 The glass structure was built in 1915, it’s owned and operated by the City of St. Paul, admission is free, a voluntary donation of $3.00 is suggested and is well worth it. 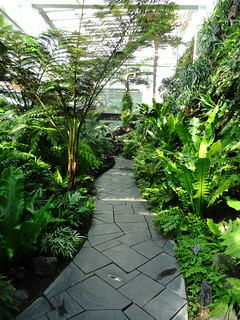 Inside we follow a concrete path through lush green foliage that leads us to the Sunken Garden, it’s stunning. 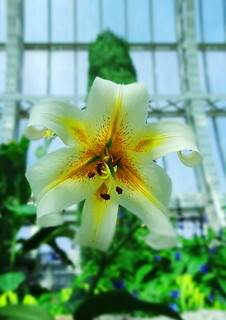 I stand there for a few minutes just looking around, I just love these enchanting old conservatories. We’re slightly elevated here, the surrounding structure feels like we’re in a magnificent greenhouse, a beautiful wrought iron fence acts as a balcony, we have a complete overview of the garden. Narrow arborvitaes stand in tall lines along the sides, yellow cannas are blooming, straight down the middle is a reflecting pool, at the far end is Harriet Frishmuth’s bronze sculpture Play Days. Star-shaped lights watch over the garden, this is the conservatory’s show house, it changes with every season, I’d love to see it at Christmas time. 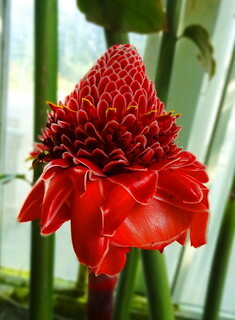 The Palm Dome is 64′ tall and 100′ in diameter, filled with tropical palm and cycad species, some are over 100 years old. 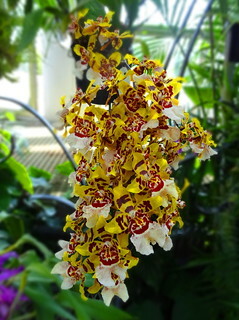 Orchids and Bromeliads are unique with their colorful blooms and thick leaves. 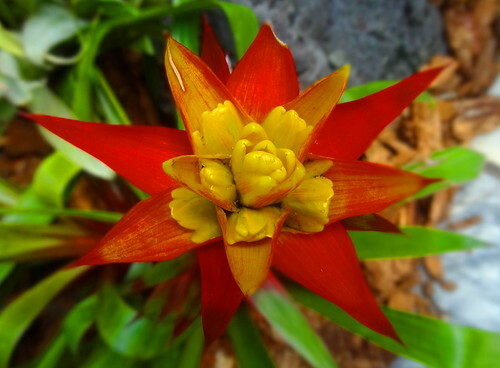 We keep a leisurely pace meandering from one area to the next, the North Garden contains useful plants; aloe, banana, bamboo, coffee, fig. 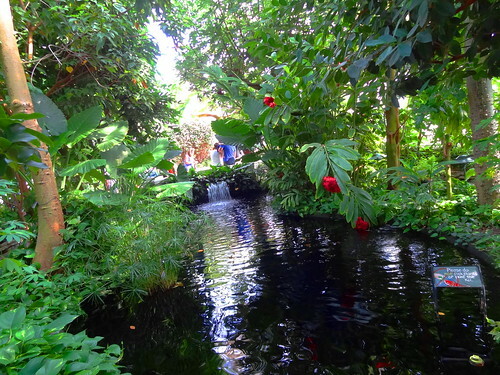 In the Fern Room a gentle waterfall spills into a tranquil Koi pond; children are excited to see the fish. There are over 100 species of fern and fern allies here, I’ve always been fond of the lacy foliage. Water gardens surround the exterior of the Visitors Center. Water lilies float in shallow pools with rock bottoms; white ones, purple ones, short, tall, pink centers, yellow centers, they’re beautiful but the most intriguing has to be the Victoria Water Lilies known as “Blooming Victorias”. Lime green platter-like plants float on the still surface, the edges curl up creating sides to the platter, revealing a fuschia-like color around the edges, I have never seen anything like them before. We drive to our next destination, Summit Avenue. 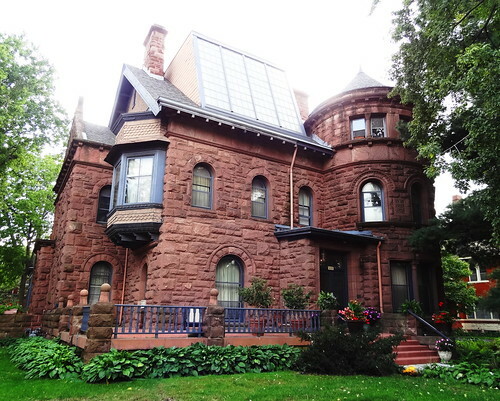 The street runs just west of downtown St. Paul and continues 4 1/2 miles west to the Mississippi River; this is the longest avenue of Victorian homes in the nation. Populated with historic houses, churches, synagogues and schools, it was named one of the 10 “great streets” nationally in 2008. 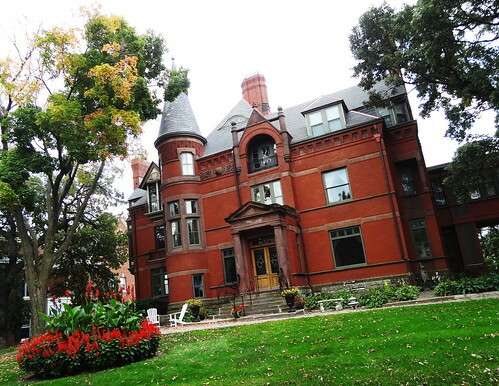 Oh, and F. Scott Fitzgerald (born in St. Paul) lived here too… Most of the homes were built between 1890 and 1920 some appeared as early as the 1850’s; out of 440 original grand mansions 373 remain today, isn’t that amazing? Let’s face it, in those days there was a lot of wealth, men got rich off lumber, mining, railroads and banks; it was a time like no other. We definitely need to take a walk. The homes are built on a bluff, stairs take you from street level to front doors, on the backside of the homes the mighty Mississippi flows below; every house is beautiful, seriously. 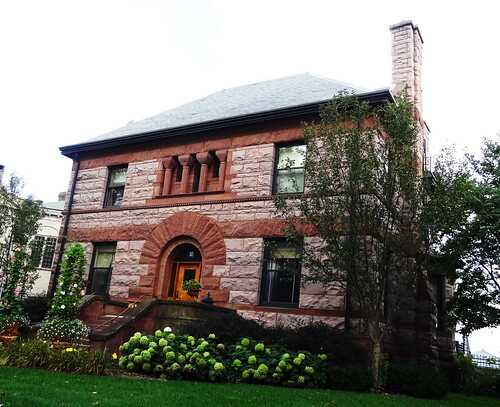 Each home is different even though many were designed by Cass Gilbert and Clarence Johnson. Notice all of the detail in the brick and stone, the chimneys and porches. The flowers that fill urns and pots are enjoying a warmer-than-usual September, hydrangea are popular here too. I notice several of the houses have covered porticos from the horse and carriage days. 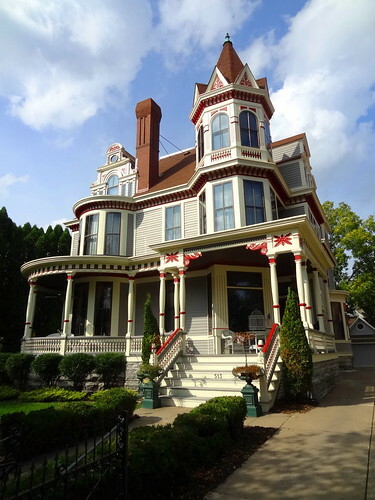 The grey and plum Victorian with the amazing porch and pointy turret was built in 1891 as Mrs. Porterfields Boarding House, they say it was home to some of F. Scott Fitzgerald’s literary friends, it’s a beauty. An orange-brick house has white-painted wood over the porch and along the roofline, notice the stone ‘stripe’ and ornamentation. 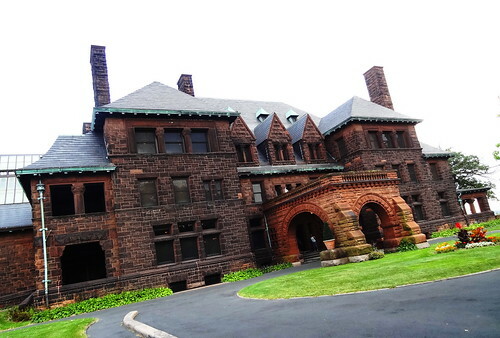 The dark brick mansion is fantastic, look at that place; stone details, slate roof, I like the rounded window on the side. 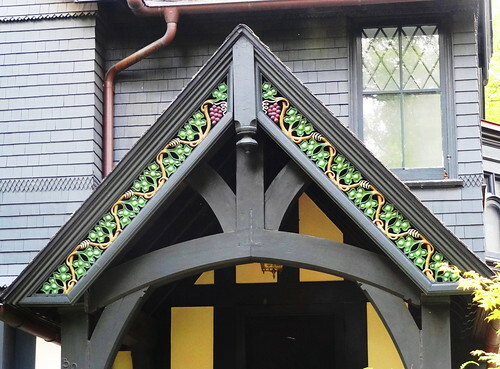 The big grey wood-shingle house is unique, lots of detail here, especially above the entryway, I admire the way they painted the grapes and vines in color. We duck down Heather Place to see the stucco and stone house, it’s enormous; 10,000 sq. ft of Tudor Revival blended with Cotswold cottage it’s a real charmer; I’ve always been a sucker for the cedar roof that wraps around the edges. The rose-colored castle is one of my favorites, built in 1883 for a coal and lumberman, it has a skylight next to the turret. 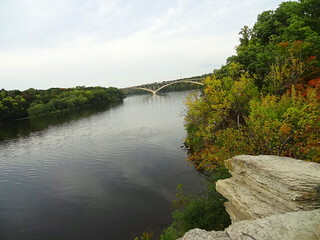 We come to a lookout called Overlook Park, there was a hotel here in 1859, wealthy folks traveling by steamboat would often stay here, it offered the best views in St. Paul with a large observation deck. After the hotel burned down it became a park in 1887, the ornamental fence you see on the right is original.The large Eagle statue was created by Louis Saint Gaudens in 1890, after being moved all around the city it was placed here in 1999. What an amazing view! Down the street is a lovely Georgian Revival built by a bank president in 1909; I am constantly struck by the time period these mansions were built, homeowners maintain them diligently from lawn and landscape to copper downspouts and roofs. There’s a lot of chunky stone, orange brick, turrets, arches, dentils and columns in stone and marble. 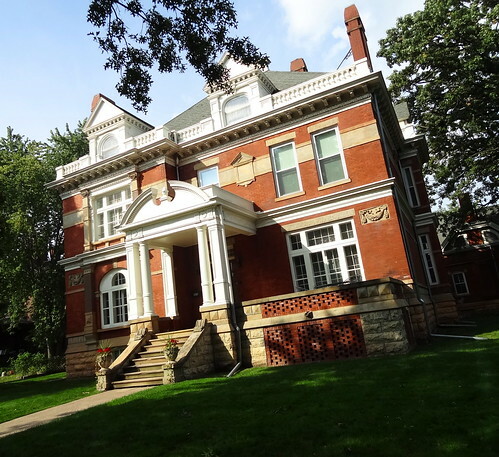 Attorney William Lightner’s house was built in 1893 in the Richardsonian style, the exterior is Purple Sioux Quartzite and Kettle River Sandstone. 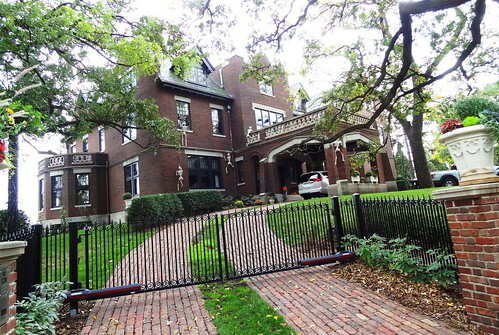 The Germanic Institute was built in 1906 as a private home for the George W Gardner family complete with a third-floor ballroom, ratskeller and 9 fireplaces; the Germanic-American Institute purchased the home in 1965. 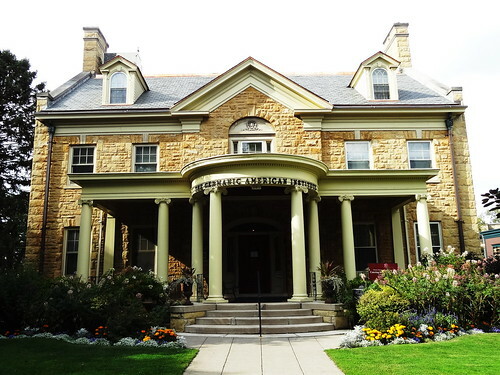 One of my other favorites is the Driscol Warehouser house, Frederick Driscol, a newspaper magnate built this 11,000 sq. 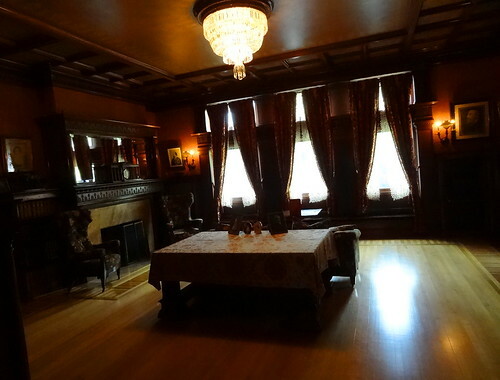 ft. mansion in 1884, a mix of Queen Ann and Gothic it has 8 bedrooms and 12 bathrooms. 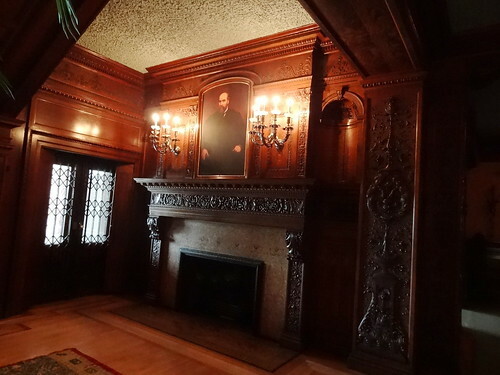 It was later purchased by Fred Warehouser, a man who owned the largest lumber company in the world, he certainly had good taste. We arrive at the James J Hill House after the last tour has started. Since we’re from out-of-town the kind woman behind the desk invites us to have a look around the first level on our own, thank you! James Hill was super-rich, he purchased the nearly bankrupt St. Paul and Pacific railroad in 1878 and over the next 2 decades worked relentlessly to push the line north to Canada and then west across the Rocky Mountains to the Pacific Ocean; it was then renamed the Great Northern Railway in 1890. His other business interests included coal, iron ore, mining, shipping, banking and agriculture–yes he had his hand in everything; he was one of the wealthiest and most powerful figures of his time. He built this opulent, 36,500 sq. ft. home in 1891 and died here in 1916. 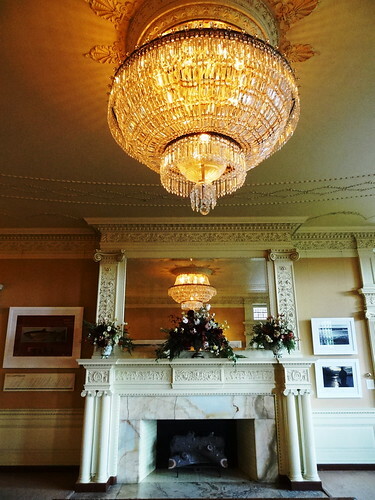 Four of his daughters were married in the home, it has 22 fireplaces, a reception hall nearly 100′ long and 16 crystal chandeliers. 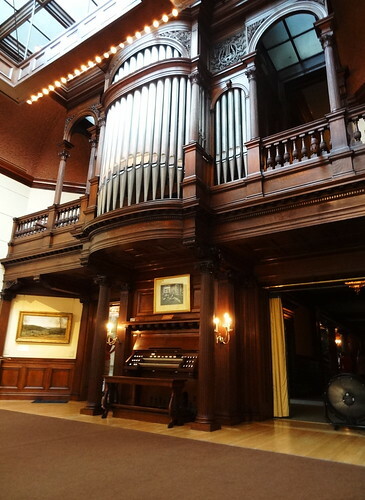 The home is a profusion of elaborately carved woodwork, ornate plaster ceilings, skylight, built-in organ complete with organ pipes; it has everything a railroad titan could wish for. 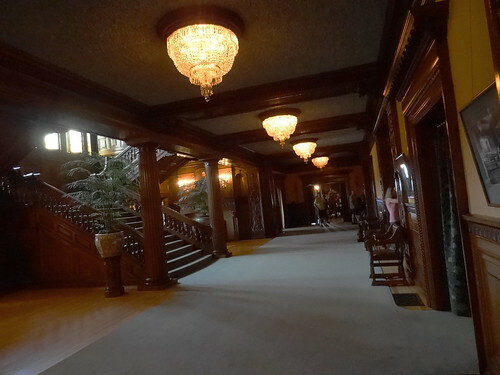 At the time it was the largest and most expensive home in the state of Minnesota; the final cost for construction, furnishings and landscaping for the 3 acre estate was $931, 275.01. After James and Mary Hill passed away the children gave to home to the Roman Catholic Archdiocese of St. Paul in 1925. 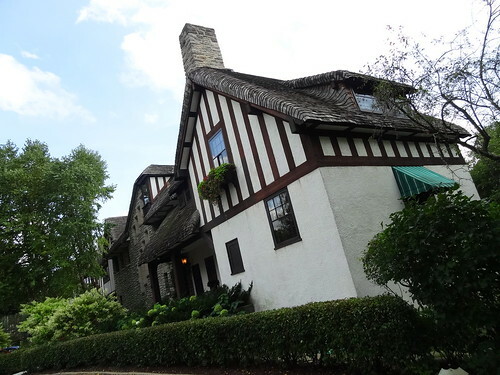 It was acquired by the Minnesota Historical Society to be used as a historic house museum in 1978. Aren’t you thirsty after all of that? 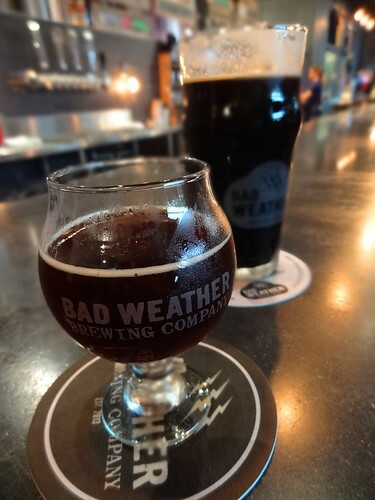 Thankfully Bad Weather Brewing Company is close by on 7th Street. 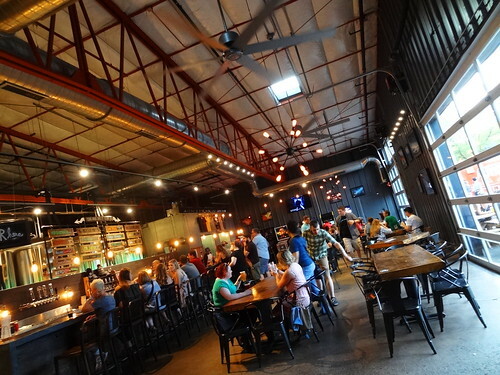 The taproom serves up a constantly changing menu of beer and house soda. The space is industrial-modern, glass roll up doors open to the patio, colorful lettering fills the menu boards. A couple of seats open up at the bar, we move quickly to claim them. Beers are named using weather terms: Cauld Weather, Ominous, Windvane, you get the idea, the labels are cool. I’m drinking the Galactic Tide Porter, Kris takes the bartender’s suggestion; we both enjoy what we’re drinking. This place is buzzing, the line to order seems endless. We enjoy our conversation with the bartenders and invite them to the Mitten state to check out what we’ve got brewing. 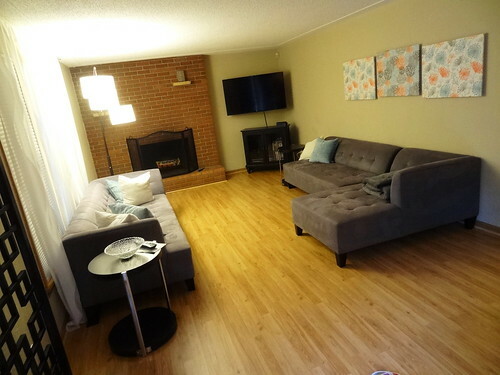 There’s a few hours left before we have to leave for the wedding, we head over to our airbnb. 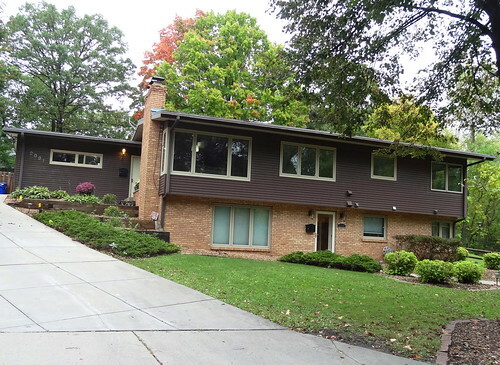 We have rented a Mid-Century Modern house tucked into a quiet neighborhood, it’s perfect for us. 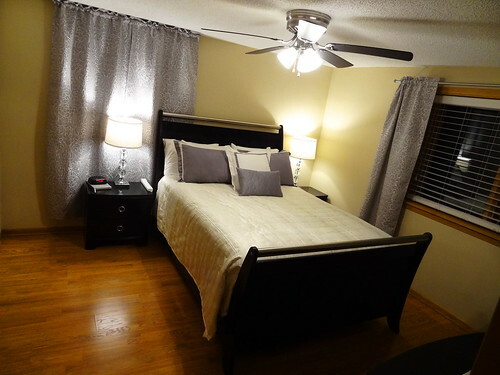 We have our own driveway and entrance on the first floor, the place is tastefully decorated, luxury linens, full kitchen, snacks; everything we need to feel at home. Our host is outstanding. Time to kick back and relax. The wedding is at Redeemed Farm in Scandia, about a 40 minute drive. Our route takes us north and east into the countryside. 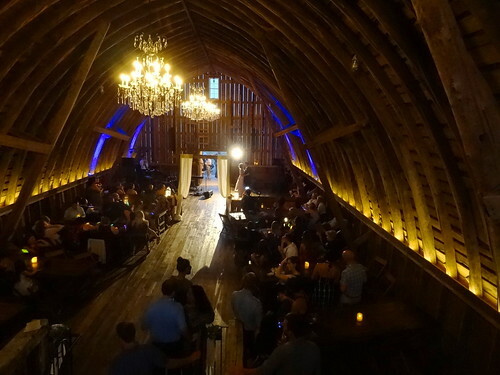 We enter the barn, climb the stairs to the loft and take our seats before the ceremony begins. The bride is gorgeous, the groom wears a big smile; the ceremony is lovely. Our evening is spent visiting with the bride and groom, eating, drinking and catching up with friends, perfect. 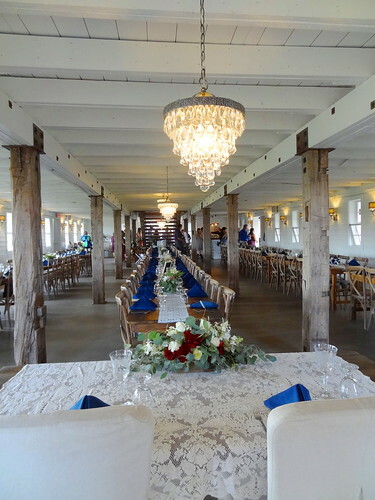 The setting is beautiful, the barns rustic and quaint, like an old-fashioned fairytale. Congratulations kids!